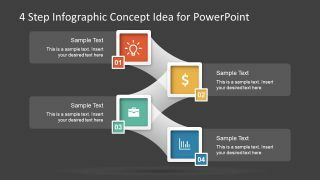 The 4 Step Infographic Concept Idea for PowerPoint contains cool clipart icons and colorful graphics. It is a 4-stage diagram of zig zag path of processes. The presentation is a roadmap of processes and activities of various concepts like business model, project planning and development etc. 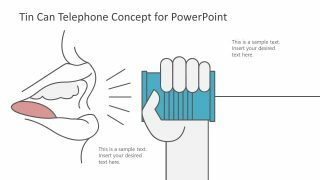 This is a creative PowerPoint of infographics for business professionals with the collection of modern graphics. 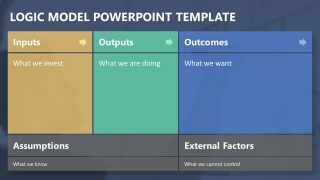 The design of PowerPoint diagram is simple and straightforward and the segments move along the thick translucent path. These segments appear as square shape buttons with small number buttons on side. Each section has an infographic for PowerPoint to represent the stages. These include, light bulb, dollar symbol, briefcase and bar chart. 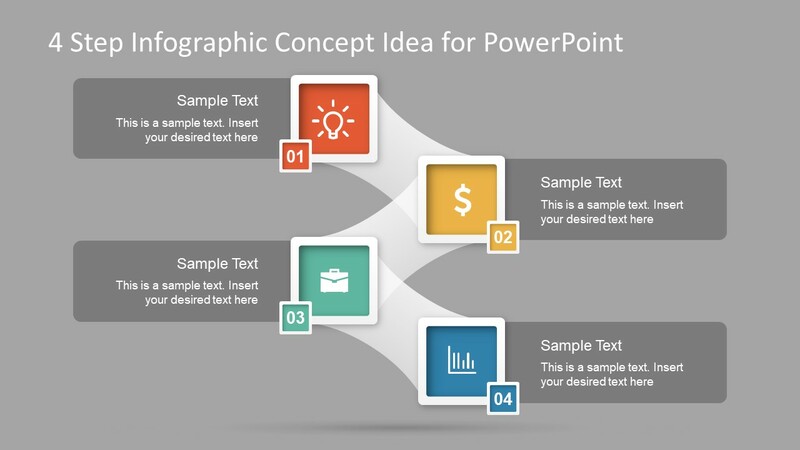 This 4 Step Infographic Concept Idea for PowerPoint is a 100% customizable template of two slides. There are two background color slides i.e. gray and black to show balance of dark and light theme. The red, yellow green and blue color of stage buttons enhance the overall diagram look. However, the editable template lets users change colors. 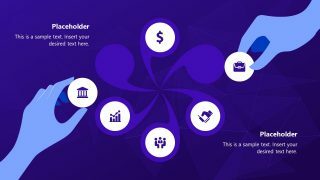 Therefore, they can change the shape, infographic icon or background colors with few simple clicks. For instance, change the background color by selecting format background in design menu bar. Choose the color from paint pallet and desire options of transparency, solid fill, gradient or texture. 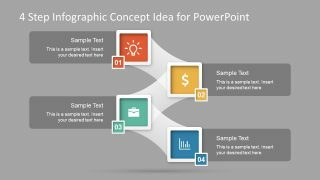 The incredible PowerPoint template of infographics is an amazing concept idea of widely useful 4 step diagram. The placeholders given in the slides assist users to add descriptions and note about their idea and concept. The font style and size is also changeable. Additionally, the presenter can copy slides to a different slideshow to summarize and review descriptive slides. 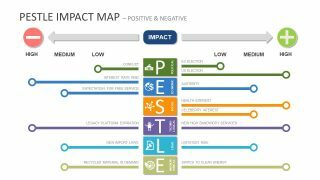 This infographic PowerPoint is design to focus on specific model and elaborate its multiple aspects. Further it can help users to retain engagement and understanding of audience regarding certain concepts.